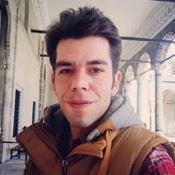 Traveler Review for Private Tour in Cappadocia, Turkey by Tour Guide Atakan C.
About Atakan C. Message Atakan C.
Atakan is a great tour guide in Turkey. He speaks English fluently and know a lot of details about the history of Turkey. We had amazing time during our trip to Cappadocia. Atakan brought us to the best restaurants in each city that we went to. He sets no time limit in accompanying us around. Will definitely look for him again in the future.Great Job Atakan!